For the 13th consecutive year, Yeshiva University will run the “Counterpoint Israel Program,” an immersive service-learning initiative that aims to empower the next generation of Israeli youth via an exciting, Jewish values-driven summer camp experience, while simultaneously instilling a sense of civic responsibility within its YU student volunteers. 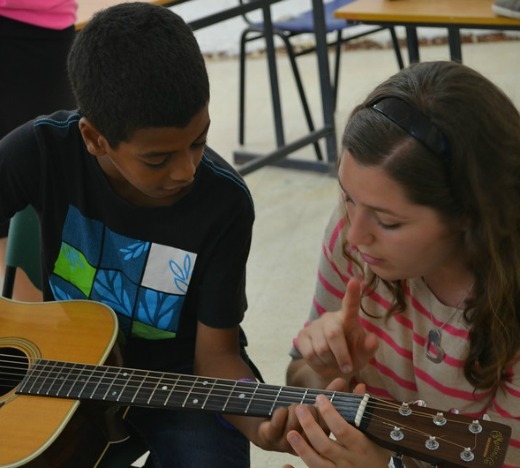 With the program returning to the cities of Arad, Dimona, and Kiryat Malachi, Counterpoint Israel will serve 200 Israeli campers from varied socio-economic backgrounds in three student-run camps from July 10 – 26. As in past years, the program is geared towards helping Israeli youth from development towns tackle self-esteem issues while enhancing their levels of English competency and computer literacy to ensure their success in school and beyond. Last year, the Israeli Ministry of Education added another dimension to the program by certifying Counterpoint as an official continuing education program and awarding educational credit to all participants. “It’s no wonder that Counterpoint has reached its milestone ‘bar mitzvah year’ having collected so many fans in the educational system, the communities we serve, and the government. Year after year, this incredible program proves to be one of our most potent and powerful educational and self-empowerment tools, creating a unique atmosphere that transforms and inspires every participating camper and counselor,” said Gabi Sackett, director of the Counterpoint Israel Program. Staffed by 29 exceptional YU undergraduate students from across the United States, Counterpoint Israel will feature English classes and workshops in arts, computers, fashion, music, dance and sports, affording the campers an unforgettable summer experience and crucial opportunities for identity building and personal enrichment. Special trips, activities and teambuilding exercises will also expose the campers to crucial information about Jewish history, heritage and culture. “Counterpoint campers find new levels of confidence through the expansion of their English vocabularies – the acquisition of knowledge and skills leaves the campers with a heightened sense of accomplishment. Additionally, dialoguing with their American counselors, who are religious Jews, and taking part in Jewish heritage programming results in the exploration of their personal and Jewish identity – exciting growth of a different kind,” said Stephanie Strauss, executive director of Yeshiva University in Israel. Over the course of the summer, each camp group will participate in “Dialogue in the Dark,” a fascinating sensory experience at the Israeli Children’s Museum in Holon, a tour of the Coca-Cola Factory in Bnei Brak, sifting dirt from Jerusalem -based archaeological digs in Emek Tzurim, and a visit to the home of Israeli Prime Minister David Ben Gurion in Sde Boker. Counterpoint Israel 2018 is run with support from The Jewish Agency, Partnership2gether, Neal’s Fund, in memory of Neal Dublinsky, Sharon and Avram Blumenthal (the official sponsors of “The Sharon and Avram Blumenthal Counterpoint Dimona Program”), the Gamson Family, in memory of Dr. Bernard W. Gamson (the official sponsors of “The Dr. Bernard W. Gamson Counterpoint Arad Program”), Check Point Software Technologies LTD., and the Municipalities of Arad, Dimona, and Kiryat Malachi.